The Imitation Game tells the story of how World War Two British researchers cracked Nazi Germany's "Enigma" encryption code. As biography and history, The Imitation Game takes many liberties, but it's a very compelling screen story and is exceptionally well acted. 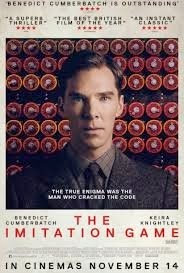 The film is (very) loosely based on Alan Turing (Benedict Cumberbatch), an individual who many regard as an architect of both computers and artificial evidence. Although based on a highly regarded biography by Andrew Hodges, the film exaggerates many aspects of Turing's character, his isolation, his afflictions, and his unhappy schoolboy years. It is structured like numerous other films in which an unlikely team of bright young minds solidifies in the name of a greater good. An inspiring repeated line–"Sometimes it is the people no one imagines anything of who do the things that no one can imagine"–is pretty much the arc of the story. Think films and TV shows you've seen of J. Robert Oppenheimer, Los Alamos, and the atomic bomb, then transpose these to Turing, Britain's Bletchley Park research center, and constructing a prototypical computer and that's the essence of The Imitation Game. This extends to the role of difficult military overseers with contempt for pinheads, Major Leslie Groves at Los Alamos, and Commander Alastair Denniston (Charles Dance) at Bletchley. Spies also plagued both projects, and both Oppenheimer and Turing had closeted skeletons–Oppenheimer's leftwing politics and Turing's homosexuality. The latter theme is woven in and out of the film in ways open to charges of being a tack-on, though we do see Turing's life unravel in 1952, when he was arrested for "indecency," Britain's code word for homosexuality. The Bletchley team included patrician scientist Hugh Alexander (Matthew Goode), Peter Hilton (Matthew Beard), Jack Good (James Northcote), John Cairncross (Allen Leech), and Joan Clarke (Keira Knightley). (Downton Abbey viewers will recognize Leech as Tom.) The ensemble are terrific together, including Knightley who, as she often does not, turns in a very convincing performance as the cryptanalyst who was briefly Turing's fiancée. Especially riveting is Mark Strong, who plays MI6 head Stewart Menzies with an icy calculation that rivals the statistical output of the Bletchley Park scholars. Ironically, Cumberbatch, though perfectly competent, is the least impressive member of the central cast, largely because he's essentially reprising his TV role as an autistic Sherlock Holmes. But there really aren't any weak links–the British simply don't junk up the screen with weak actors, no matter how small the role. The Imitation Game is a taut and thrilling 114 minutes because the acting is so good and the stakes were so high. It's a very good film, though not a perfect one. Add Alexandre Desplat's score to the ever-growing list of overwrought composers. (Honestly, must soundtracks slap us in the ears to telegraph every action?) As noted earlier, the story on the screen departs from reality, including portraying Turing and Clarke as closer than they were. There are other dramatic contrivances and coincidences, some of them rather obvious. The film's title seems to have been chosen because it sounded good and then a scene was written to explain it. It references a test that helps determine if a response comes from a person or a machine–think Deckard in Blade Runner– but its applicability for this film feels forced. But there is little dispute that breaking the Enigma code was a major accomplishment that both shortened the war and saved untold numbers of Allied lives. Spoiler Alert: Stop here until you've seen the film (which you should) as below I've listed several of the film's inaccuracies. -- Turing is not thought to have suffered from Asperger syndrome. He did, however, later suffer from gynecomastia caused by the court-ordered chemical "castration" drugs he took after his arrest. --Turing, though an egghead, was not as socially isolated as the film suggests. He mentored several researchers before he was forced to leave Cambridge. --The machine the team built was not named "Christopher" for Turing's unrequited schoolboy love; it was commonly called "Bombe." --Turing did not invent the machine out of thin air; he refined models developed by Polish researchers. --One dramatic scene shows the team making a decision that led to the death of Hilton's brother. This is a fabrication. --Although Turing and Clare were affianced briefly, she probably knew of his homosexuality at the time. There is no evidence that she ever contacted him after the war ended and the Bletchley project shut down. --The code-breaking machine (surprise!) developed slowly and incrementally, not in one big revelatory moment. --Turing's team was not five (with Clarke an honorary member); over 1,500 people worked at Bletchley. --The film states categorically that Turing killed himself in 1954. In fact, his suicide is conjectural. It is known that Turing was using the cyanide in his experiments and ingesting it could have been an accident. There was, however, a half-eaten apple by his nightstand that might have been the suicide delivery vehicle. It was never tested, though one theory holds that it was a macabre homage to Snow White, a film over which Turing was reportedly obsessed.